Many people swear that finding sharks teeth is nearly impossible, but the trick to it is knowing what to look for. First of all, the best time to find sharks teeth on Edisto Beach is to go at low tide and walk slowly in the wet sand, but make sure to stay far enough away from the surf so that any potential finds dont get washed away. 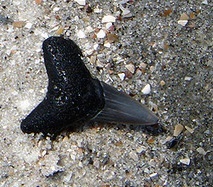 Many times the teeth are just lying on top of the sand and clearly visible to beachgoers. Another good place to find some teeth is by the groins lining each block on the beach. One thing of note: the teeth vary in size. On Edisto Beach, the teeth are generally the size of fingernails to roughly the size of a toothpick (if you find a good one). Some people have an eye for finding the fossilized teeth, which look like shining specs of black onyx; others arent so lucky. One good way of learning how to eyeball a tooth in the sand is to have someone else throw one down near you so that you can see what it looks like and hone your tooth-finding skills. If you do look down at the sand and see something that might be a tooth, go ahead and pick it up. If it is easily breakable, its not a tooth. But if its got a pointy or jagged edge and a thickened base and looks like a tooth, then chances are youve found a tooth nestled safely in the sand and out of a sharks mouth. Postcards available at local shops in the area provide a way to determine what kind of shark the tooth is from. Hammerheads, tiger sharks, and sand sharks are just a few of the original keepers of the teeth found locally. Finding the first tooth is always the hardest. Once you pocket your first find, the rest come naturally. But if after year after year of turning up nothing, you might want to just go buy one at a gift shop and pretend your purchase is the real deal  only you will know the truth. My husband's family has been vacationing at Edisto the second week in June for 30 years. I have been searching for my first shark's tooth for 5 years. Finally this past June, I found my first. And you are correct when you say that after you find the first it just comes natural. I would walk the beach with my husband and it would seem he could spot them a mile away and I got nothing. We found a total of 72 when we visited in June. It becomes an all consuming passion once you get your first one. Memories made in one of our favorite places.